Coming home at Dawley Farm Village is different. Start your day with a walk to a coffee shop to grab a to-go cup or meet friends. Make an easy appointment nearby for a manicure or massage. Stop by your on-site fitness center, or sit a bit by the swimming pool. Ready for dinner? It's just a quick walk to pick up some groceries or treat yourself to frozen yogurt at night. Leave your car at home. Find time you never knew you had and convenience beyond belief. That's the Dawley difference. From studios to three-bedroom townhomes, you'll find all options at Dublin Square. Units include a washer/dryer, patio/balcony, clubhouse, fitness center and more. We welcome your pets. For more details, contact us at 605-274-3393. 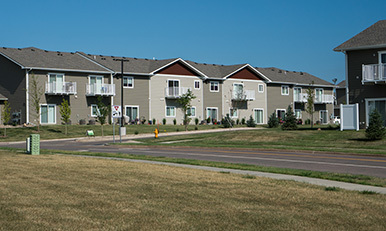 Nestled in a peaceful area but an easy trip to Dawley Farm Village, the Red Oak Senior Apartments welcome residents 55 and older. These one and two-bedroom units include all appliances, walk-in closets, and fitness center and community room. To learn more, call 605-371-3333.